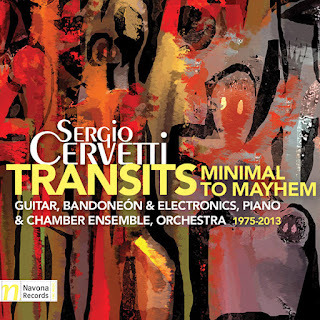 The music of Sergio Cervetti has gotten the spotlight on these pages before (type his name in the search box for previous reviews). He returns to us today with a nice kind of mini-retrospective of pieces written between 1975 and 2013, on Transits, Minimal to Mayhem (Navona 6001). Here we experience a variety of works, all of interest, from the recent piano and winds "Concertino" (2013), the orchestral "Candombe" (1996), to the piano and electronics "Exiles" (1980), the bandoneon and electronics "El Rio De Los Pajaros Pintados" (1979) and the "Guitar Music" (1975). The music covers, as the title suggests, a movement from stylistic way-station-to-way-station. Minimalism is out front on the mesmeric, primal repetitiveness of "Guitar Music," has a more developmental flourish on "Candombe," and shifts to a sort of ethereal radical tonality on the soundscape singularities of "El Rio De Los Pajaros Pintados" and "Exiles." The final work chronologically, "Concertino," has a modern neo-classicism and a nicely developed thematic arc. These are very worthwhile works, performed in the main quite well, but in any case some high points in Cervetti's compositional oeuvre over the past 40 years, give or take. They stand out with distinction and show us his essential qualities as melodist and colorist, his rhythmic vitality and harmonically modern sophistication. I was taken by this anthology and will certainly come back to it to savor the originality and lively pointedness of Cervetti at his best. I recommend you hear it, too.